Is Man Basically Good or Evil? If a man asks you this question, beware! He is most likely just looking for an argument. In fact, a question like this is just begging for fruitless, heated discussion. Allow me, however, to presume to answer this question once and for all, and prepare you with the biblical answer. 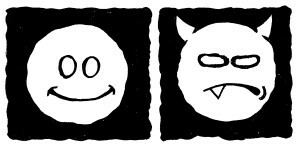 The answer isâ€¦man is BOTH good and evil. However, before we examine the biblical viewpoint, there is one more point to be made about this question, and that is – this is a bad question. Firstly, the question is formed in such as way as to only offer you two solutions, when in fact, there are more than two solutions. In logic, this error is known as bifurcation. Secondly, this question is overly vague, and allows for plenty of misunderstanding. What to we mean by â€œgoodâ€? â€œEvil?â€ What do we mean by â€œbasicallyâ€? Until we define these terms, and reformulate the question in a way that allows for more than two polar opposite answers, we are wasting our time. As humans mature, we eventually begin to ask the big questions, those of meaning. We begin to ask the questions that collectively have been called â€œworld viewâ€ questions. The question that begins this discussion might be better broken into two, asked in this way: â€œWhat is the nature of man?â€ and â€œWhat is wrong with man and society?â€ These are just two of the succinct set of questions one answers when developing a world view. As with any scientific or psychological model, the better our model matches the known facts, the closer it describes things as they actually are. In his series of bestselling books on the spiritual life, author and psychologist M. Scott Peck described his spiritual journey over the course of many years. In his book Further Along the Road Less Traveled, Peck declares that many profound truths appear in paradoxical pairs. For instance, he asks, should we be independent or dependent? On first blush, these two concepts may seem to be mutually exclusive, but the truth, of course, is that we need to exercise both qualities, sometimes simultaneously. To tout the virtues of one or the other side of this paradoxical pair, Peck argues, is a type of â€œheresy.â€ Many other truths exist in paradoxical pairs, such as the relationships between mercy and truth, faith and good works as evidence of faith, and predestination and free will. In each case, correct doctrine requires that both exist in cooperation, rather than in exclusion to one other. Paradox also applies to the question of man’s goodness. The bible teaches that man and woman were made in God’s image. Over the centuries, theologians have argued about what the terms â€œin Our image,â€ and â€œlikeness,â€ mean, but all agree that man was made with attributes that make him like God. Many other biblical passages express awe at God’s amazing creation, which of course, includes man himself. Just as we can look at the sky, or plant life, or magnificent mountains, and experience awe at the majesty and beauty of creation, we should be able to look at our fellow humans, their bodies, souls, and spirits, and be awestruck at how intricate and beautiful their design and potential are. The other biblical view of mankind however, is that man is spiritually fallen. From this vantage point, the bible views man as fallen and separated from God, then presses man’s need for God, and for the redemption that Jesus effectuated on the cross. Many individuals have chosen to believe that man is made in the image of God, and that all evils are a result of our difficult external circumstances. Under the right circumstances, they say, all men would be kind and loving, and even unselfish. In the â€œnature or nurtureâ€ discussion, humanists err on the side of nurture when it comes to human evil. Acting on this philosophy, they have done much good for mankind. They focus on a human’s natural potential, they aim to create external circumstances that lead to health and happiness for all humans, and they help us to appreciate the beauty hidden in each of us. Running on this one rail of truth, they have made many happy. But, as discussed previously, truth is not a monorail, there is a paradoxical partner to the truths of man’s beauty and divine nature. A fundamentalist might agree with the statement â€œman is made in the image of God,â€ but to them, that image has been so marred by sin, that it is unusable. They emphasize that a person can not lift themselves up out of their moral guilt and flawed nature without God. And for many people, this has been good news. See People are Basically Good – Proof to the Contrary – this article, at an otherwise respectable Christian apologetics site, is typical of the one-sided Fundamentalist view of man. One of the founding principles of the highly successful Alcoholics Anonymous program is that in order to kick addictions, we must depend on a power higher than ourselves. To those who have tried to change unsuccessfully, or those who recognize the deep levels of depravity to which they have sunk, a rosy humanist message extolling their own inner beauty and ability to change sound like hollow, foolish statements. But through emphasis on God’s ability to change a person, to imbue them with a spirit that can help them do right, and through the message of God’s justice and forgiveness, many people have been dragged from the brink of death. However, because fundamentalists have a mistrust, even hatred for the natural abilities of humanity, they often damage the souls of the very people they try to help by teaching that we should reject all things that smack of human endeavor or ability. This can include disparagement of one’s natural abilities and interests, and in extreme cases, of the sciences (which rely on man’s mental abilities, which are â€œcorrupted by sinâ€), the arts, and even of any encouragement of individualism and personality. Of course, adopting both of these positions allows one to gain the benefits of both, we can enjoy ourselves and one another as beautiful creations of God. We can develop and employ our abilities and gifts without guilt, and enjoy our own souls and bodies as God’s gift. On the other hand, in our inevitable times of weakness and moral failure, we can avail ourselves of the freedom that truth, admission of guilt, repentance, and faith towards God provide. We can offer hope to the most broken and frail, knowing that there is a power greater than us both available to forgive, love, and heal – all necessary components of true redemption. Humanism has nothing to do with man's natural abilities. It has everything to do with accountablility– humanism says man is acocuntable to no one but man himself. Humanism and Christianity cannot mix; if they are mixed, it is a different gospel. For a great fact sheet on humanism, check out this link: http://www.dreamscape.com/rebecca3/Pages/Humanism%20and%20Public%20Schools.htmTo read The Humanist Manifesto I and II, it is here:http://www.dreamscape.com/rebecca3/Pages/The%20Humanist%20Manifesto.htmAlso, two outstanding books are America Betrayed by Marlin Maddoux and A Christian Manifesto by Francis Schaeffer. I think that man's abilities are certainly a part of humanism. In fact, the first link you provided has these two definitions right at the top – it defines humanimsm as:any philosophy which recognizes the value or dignity of man….A humanist was originally one who focused his studies on man, his art and thought, and nature…This is exactly what I mentioned as a half truth. Humanism is primarly wrong in that it excludes God and man's fallenness and need for God.The biblical view affirms man's "value and dignity" (because man is made in God's image), as well as his natural gifts, as reflected in "his art, thought, and nature." Affirming these is not "mixing humanism with Christianity." It is merely affirming the truths of humanism, while identifying the lies of humanism, which reject man's need for and accountability to God.I think we agree, but you seemed to have understood my inclusion of the truths of humanism into the biblical view as some sort of syncretism. However, my goal was to show that there are two sides to the truth about the nature of man, and neither the humanists nor the fundamentalists are correct when they choose only one side of this truth, AND, the biblical view embraces both sides of the truth – the fundies have misrepresented the scriptures.